HC-235 21.2cc 30" Single Side Hedge Trimmer and HC-245 21.2cc 40" Single Side Hedge Trimmer are sold out and no longer available. New HCS-3020 21.2cc 30" Single Side Hedge Trimmer is available at $519.99 retail. 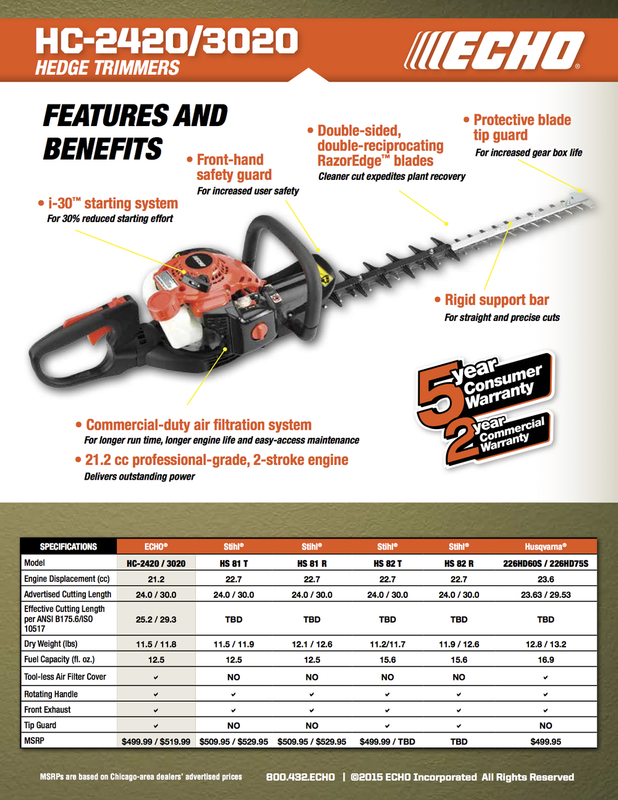 New HCS-4020 21.2cc 40" Single Side Hedge Trimmer is available at $539.99 retail. 30” or 40" single-sided, double-reciprocating RazorEdgeTM blades. We have sold out of the ECHO HC-185 at $489.99. It is replaced by the New Model HC-3020 at $519.99 Retail. HC-165 @ $469.99 is SOLD OUT & no longer available. New HC-2420 24" Double Sided Hedge Trimmer @ $499.99 Retail is Now Available. HC-165 at $469.99 is sold out and no longer available. New HC-2420 24" double side Hedge Trimmer at $499.99 retail is now available.